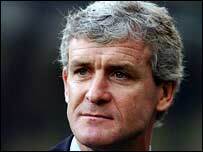 Blackburn boss Mark Hughes has agreed a new three-year contract at the club. The 42-year-old former Manchester United striker guided his side to next season's Uefa Cup and will remain at Ewood Park until at least 2009. Rovers chairman John Williams told the club website: "Mark ticks all our boxes and is liked by everyone at the club." Assistant manager Mark Bowen and first team coach Eddie Niedzwiecki have also signed new deals understood to be on similar timescales to Hughes'. He spent two years as a player at Ewood Park under Souness after joining Rovers from Everton in October 2000. He took over as Rovers boss for his first spell as a domestic manager from Graeme Souness in 2004 after five years in charge of his native Wales. And he said: "I am excited by what is happening with Rovers and am very happy to pledge my future to the club. "We have enjoyed a great season and I am looking forward to being part of the club's success going forward." Williams added: "His record speaks volumes. I am delighted with this development, it is excellent news for the club." In his first season as Rovers boss Hughes finished 15th with 42 points and led his side to the FA Cup semi-final where they fell to Arsenal.